Elemental, black-on-white design complements its companion holder (House of DoolittleTM 124) and provides a clean, professional look. Ruled daily blocks help keep notations neat, and a full-year reference calendar helps make planning easier. Made entirely of recycled materials. 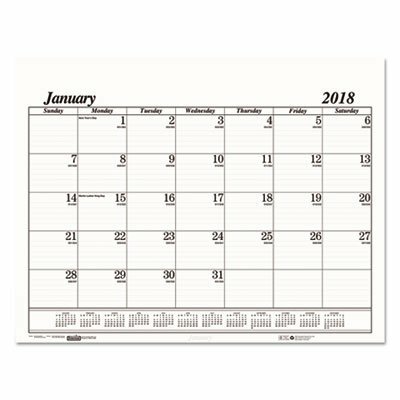 Size: 22 x 17; Page Color/Theme: White; Edition Year: 2018; Calendar Term: 12-Month (Jan.-Dec.).